The United States Mint America the Beautiful Quarters™ Program was officially announced on September 9, 2009. This new program encompasses a total of 56 new quarter designs that will run from 2010 through 2021. At a rate of 5 per year, a new America the Beautiful Quarters will be issued featuring a reverse design emblematic of a National Park or National Site from each state as well as Washington D.C. and the U.S. territories. After consulting with the executive in charge of each locality and with the Secretary of the Interior, the US Mint submitted a list of recommended sites to Secretary of the Treasury Timothy F. Geithner who approved it on August 25, 2009. The order of issue for each coin was determined by the date the site officially came under the control of the United States government. As such, Hot Springs National Park in Arkansas was the first coin in the new series. The national site was created as a reservation area in 1832 and renamed a National Park in 1922. “These new quarters will honor some of our most revered, treasured and beautiful national sites — majestic and historic places located throughout the United States and its territories that truly make us ‘America the Beautiful,'” said United States Mint Director Ed Moy. The obverse (heads side) of the America the Beautiful Quarters feature a portrait of George Washington based on the historic image that first appeared on the quarter in 1932. The United States Mint states that “subtle details and the beauty of the original model” will be seen in the William Cousins version that will be used (included design image shown above.) Cousins is no stranger to coin design, as his work has been seen on quarters since the 1999 launch of the 50 State Quarters® Program. 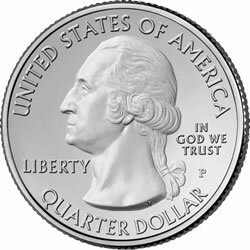 In addition to the quarter-dollar coins, the America’s Beautiful National Park Quarters Dollar Coin Act of 2008 (Public Law 110-156) that authorized them also calls for massive America the Beautiful Silver Bullion Coins to be released that are “exact duplicates of the quarter dollars.” These bullion strikes are 3 inches in diameter and weigh 5 ounces. According to the law, each silver bullion coin will not be available until the quarter with the same design is issued. Following is a complete list of the chosen sites to be featured in the America’s Beautiful National Park Quarters Program. Each entry shows the state, territory or district in which the site is located along with the year it came under federal control. For more, also see sister site America the Beautiful Quarters. I LOVE the designs they come out with! I feel like its a form of appreciation to what has made our country what it is today! I am new to coin collection. How do I go about buying the best quality coins for 2010? All help is appreciated. i was wondering where can i sing upi tp get the park quarters . i have a note book to put the quarters in and i never see the quarters . Wheres the ADK quarter at? HAVE ANY OF YOU BEEN TO GARNER STATE PARK IN TEXAS???? IF YOU HAVE TO ASK WHERE IN THE WORLD THAT IS ,, THEN YOU NEED TO RUN , NOT WALK , RUN TO GARNER!!! IS THE MOST BEAUTIFUL PLACE ON GODS GREEN EARTH! IS FROZEN IN TIME IN THE 60 S. YOU WILL HAVE THE TIME OF YOUR LIFE IN GARNER AND NEVER, EVER , WANT TO LEAVE. Since there are fewer being minted, there are reports of a few sighted in circulation, banks and businesses are not reliable sources, but they will only cost twenty-five cents. You can purchase rolls (of 40) and bags (of 100 or more) of uncirculated quarters online at the US Mint website, where prices are about 40 to 50 cents per each. If you prefer singles, expect to pay a dollar or two each at your local coin dealer or coin show. Internet search will help you track them down. Start now and keep going. i’ve been collectin quarters since i was in 5th or 6th grade (im currently abt to start my 9th grade year)and i have every state except 4 alabama and have every U.S territory quarter including D of C and then i found this site and my eyes lit up i have already found 2(acadia and olypic) only thing is i dont have a book where can i find 1?